Whitehall becomes Parliament Street and then runs into Parliament Square. 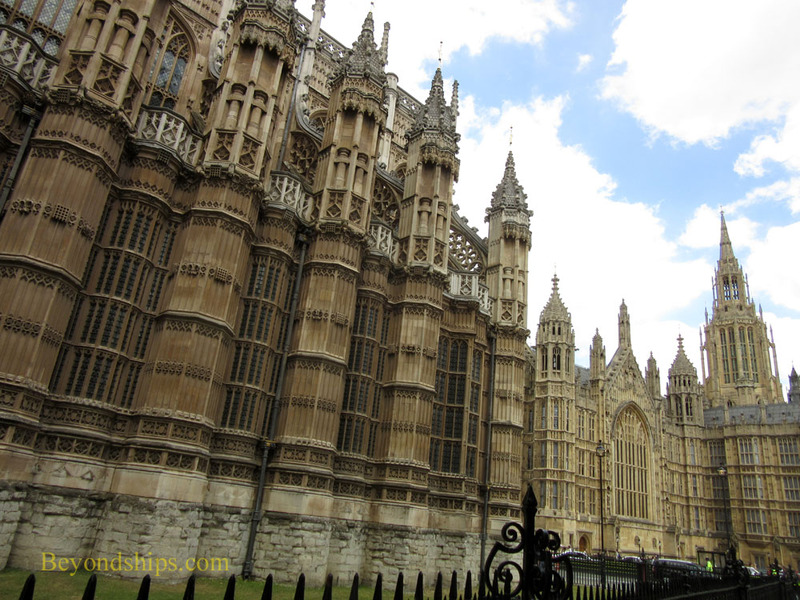 On the southwest corner is the Palace of Westminster also known as the Houses of Parliament. This is the epicenter of British government. The British system of government rests upon the principle of Parliamentary Sovereignty. Under this system, Parliament is the supreme legal authority. Parliament consists of two houses. By far the most powerful is the House of Commons,which is made up of elected representatives. The party that has a majority of the elected members forms the government and its leader becomes the prime minister. With much less power is the House of Lords. As a result of relatively recent reforms, most members of this house are appointed by the Queen upon the advice of the prime minister. Hereditary peers no longer have an automatic right to membership although a certain number are appointed. The idea is that the people appointed will bring unique expertise to the legislative process. 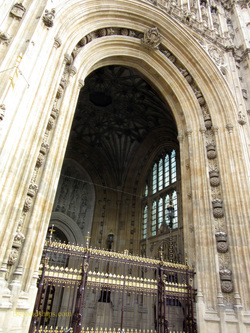 Parliaments have sat at Westminster since medieval times. The Palace of Westminster was the principal royal residence until it was largely destroyed by fire in 1512. At that point, Henry VIII moved elsewhere and gave over the remains of the Palace of Westminster to Parliament and the law courts. In the centuries that followed, the old palace was rebuilt and expanded as the power of Parliament grew. However, in 1834, another fire ravaged the Palace destroying almost all of it. William IV offered Buckingham Palace as a new home for Parliament and proposals to move elsewhere were also mooted. However, tradition was too strong and so it was decided to build a new Palace of Westminster on the old site. A competition was held and the design submitted by Sir Charles Barry was selected. It called for a Gothic-style building, which was in keeping with the popular nostalgia for things medieval. The building would have over 1,000 rooms including the chambers for each House. Inasmuch as the Palace was still officially a royal residence, it would also have rooms for use by the monarch on state occasions such as the annual State Opening of Parliament. Construction of the new palace took some 30 years, although the building was in use well before completion. The interior of the palace is elaborately decorated with frescoes, paintings and statues. During World War II, the Palace was hit by bombs several times. One of these destroyed the chamber of the House of Commons. The affected areas have been rebuilt. The public can attend the debates of both Houses as well as committee hearings. 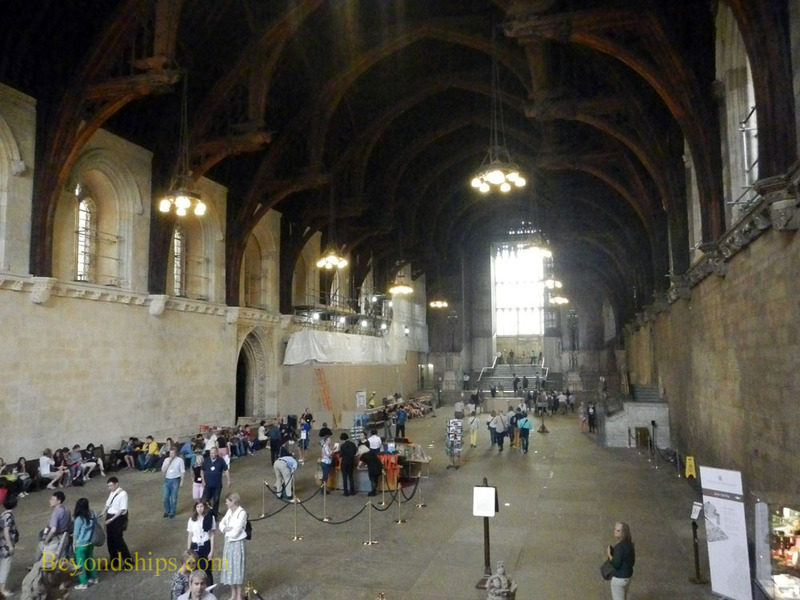 There are also guided tours of the building that take you through the chambers of both Houses, the rooms used by the Sovereign and the public areas. U.K. Residents can also tour the Elizabeth Tower and see Big Ben. 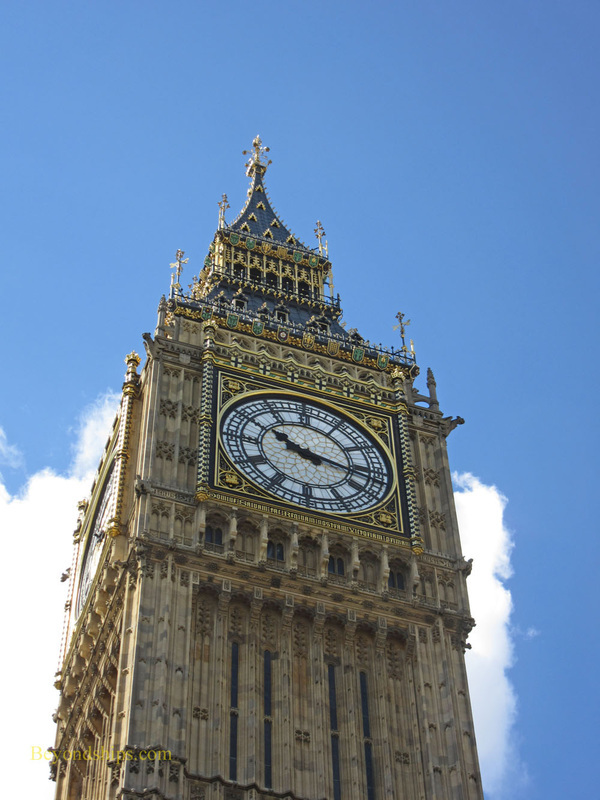 ﻿Without question, the most familiar landmark in London is the tall clock tower at the Houses of Parliament. Often referred to as “Big Ben,” the clock tower is actually named the Elizabeth Tower. (Big Ben is the name of the great bell inside the tower). 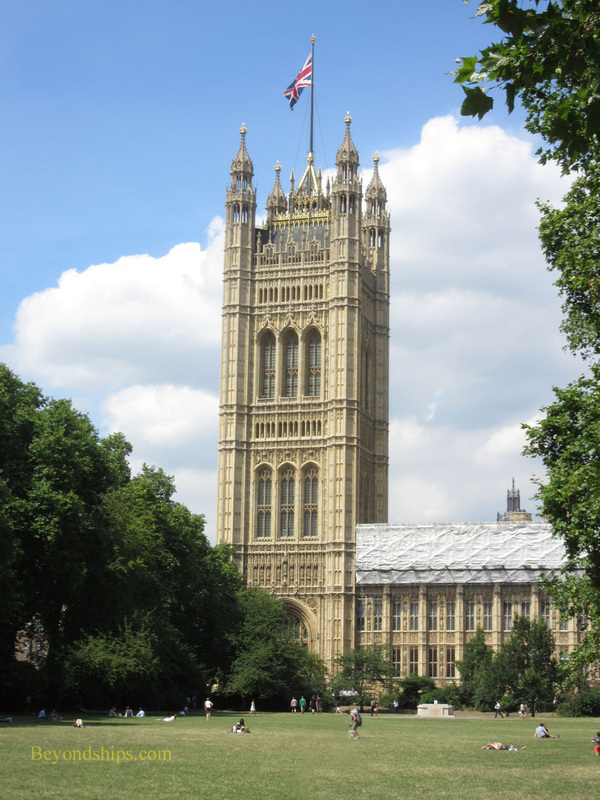 Although the Palace of Westminster had had clock towers since the 13th century, the tower we see today was an afterthought when the current building was designed. Sir Charles Barry added it to his design in 1836 after he had already won the competition to design a building to replace the palace that had been destroyed by fire in 1834. ﻿Above: The Victoria Tower is the largest of the three towers at the Palace of Westminster. It overlooks a pleasant green space. Across Abingdon Street from the Houses of Parliament is the Jewel Tower. This medieval structure is one of the few buildings to have survived the 1834 fire that destroyed the bulk of the Palace of Westminster. 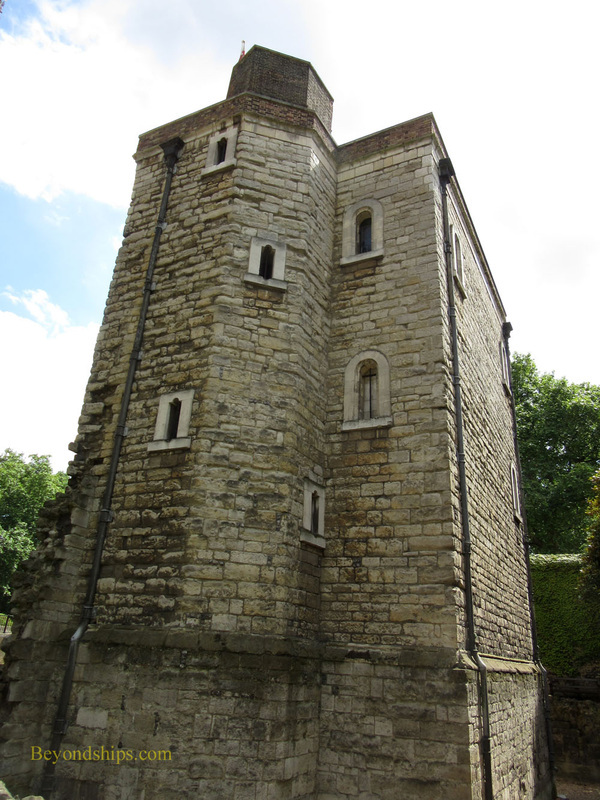 Built between 1365 and 1356, the original purpose of the Jewel Tower was to house King Edward III's treasure. After a fire in 1512, most of the royal jewels were transferred elsewhere. (Today, the crown jewels are kept in the Jewel House at the Tower of London). In 1621, the Jewel Tower became the depository for the records of the House of Lords. It continued to fulfill this function until the 19th century when the records were moved to the Victoria Tower across the street. Next, the Jewel Tower became the site of the Office of Standards and housed the country's official weights and measures. Damaged during World War II, the Jewel Tower was restored and opened to the public. It is now under the care of English Heritage. The Jewel Tower hosts an exhibit telling the story of the Jewel Tower. However, it is primarily of interest for its medieval architecture including its 14th century ribbed vaulted ceiling on the ground floor. For more information, see the English Heritage website.